Certified Nurse Midwife, Alysha Walker, of Lincoln Medical Group Women’s Center delivered both the first baby of 2018 and the last baby of 2017 just 15 hours apart at Lincoln Medical Center. 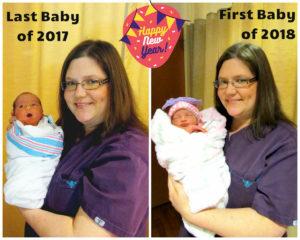 The hospital’s last baby of 2017 was born at 6:44 in the evening on December 31st. Leela Mary Hickerson weighed in at 7 pounds 3.6 ounces and was 20 inches long. She is the first child for parents John and Ashley Hickerson of Fayetteville. Fayetteville’s first baby of 2018, Savera Joii Burnette arrived at 9:13 am on January 1st. Savera is the daughter of Tasha Moore and Shamario Burnette. She weighed 4 pounds and 15 oz and 18 ½ inches long. Congratulations to both families on your beautiful baby girls!